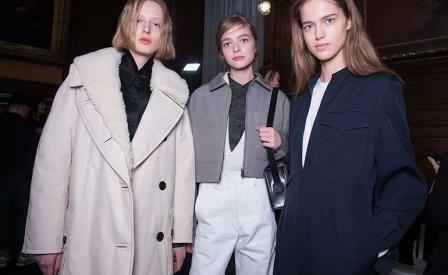 Scene setting: The vista out onto a historic sandstone quadrangle within Paris’ Université René Descartes made for a fitting outlook for Christophe Lemaire’s A/W 2016 collection; his fresh faced model students looking right at home on the city’s Sorbonne campus in their effortlessly chic, collegiate tailoring. Mood board: The Frenchman combined a louche Seventies vibe with a buttoned-up Victorian primness, seen through his high collared, bell sleeved blouses and twice-pleated virgin wool trousers, which offered a monastic yet youthful mélange. Best in show: Lemaire’s subtle reworking of the traditional cable knit sweater – now inflated with leg-of-mutton sleeves – and front seamed flares cut in retro hues of mustard and tangerine, looked especially campus appropriate when paired with his heeled leather oxfords and vegetable tanned leather camera bags.